SLIDER Magazine Issue 09 – EQUAL DIST. Thanks to both Nato and Makoto at Maxwell Distribution for their shared support and for putting this into action! Ken Goto came through and snapped photos of both Geoff McFetridge (in LA) and myself for the Solitary Arts for Issue 09 of SLIDER Magazine out of Japan. The cover for this issue of SLIDER is the classic J. 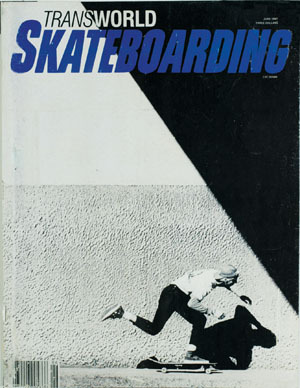 Grant Brittain photo-cover from Transworld (June 1987) of Tod Swank. Issue 09 features 6 luminaries in skateboarding photography and a photo retrospective of their works, along with a 20 page article on Tommy Guerrero, Ray Barbee, Matt Rodriguez, and Chuck Treece's (BLKTOP Project) most recent tour of Japan, all shot by Goto. You can order it through their site as it's well worth it. Comes with a nice calendar too! Click below on the image to head over to SLIDER Magazine's site. They've got a web banner that includes both Geoff McFetridge and Yong-Ki Chang, shot by Andrew Paynter. Thanks Andrew!